Classic-Castle.com • View topic - Settlers of Catan? I'm sure many of you are familiar with this board game. If not it is a game dealing with the exploration of this island of catan set in a medieval time period. You can buy expansion packs which add things like barbarian attacks, sailing to new islands and sending out knights to protect your borders. Catan is a fun game, Sometimes having your fate controlled by the roll of the dice can be frustrating. But it's still a very good game on a rainy afternoon. This is one of the few cuusoo projects worthy of support. 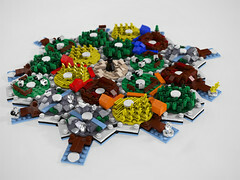 Never played Catan, but I searched the net for some boards picture and that lego representation is pretty good. I don't think I would like such a game, but I would love to make it from lego pieces. I had heard of Catan for many years and even seen Todd Webb's Lego Catan board at BrickFest/Fair years ago. It wasn't until recently that I got into it and actually started playing it. Surprisingly it's a lot of fun! A lot of luck based on die-rolling but some strategy elements as well. And, as with most European style games, everyone is in the game until the end. Mark of Falworth wrote: Catan is a fun game, Sometimes having your fate controlled by the roll of the dice can be frustrating. But it's still a very good game on a rainy afternoon. That is easily fixed with the event cards varient. I personally love catan, it is my favorite game! The base game itself an be a bit dull at times, so got the seafarers and cities&Knights Expansion. Yeah, I've played Settlers of Catan with my friends several times, it's been a lot of fun. For Christmas '11 I received the Rivals for Catan card game, it's a little different because you have cards representing the map, buildings, events and everything. But once you get the hang of it, it's really enjoyable for a few hours you might need to burn. friskywhiskers wrote: That is easily fixed with the event cards varient. This is true although next game I'd like to play using the dice for resources (because we like the randomosity of die) and event cards. Actually, I might revisit the two player card game (played that a few times and don't mind it) to check how the event cards include it. The wife and I finally got around to trying out Traders and Barbarians over the break (I scored it mid year for my birthday). We've used the variants and have played three of the five scenarios. Keen on playing them with others (have organised a couple to come over on Sat a they own Cities and Knights). We also have Seafarers but have only played the first two scenarios. The annoying thing I discovered is that the 5-6 expansion for SF included the original rule book and the scenarios have been revised between the print I bought and the rule book I received. Thankfully they list the PDF on their site. I'm going to ask for Cities and Knights for this years birthday so I'll look forward to playing a mega game with all scenarios at some stage. Settlers is a favorite in our house. Oddly enough we have 3 of the smaller expansions that we haven't even opened yet...Fisherman of Cataan, The Great River & Oilfields of Cataan...at least I think those are their names. JoshWedin wrote: Settlers is a favorite in our house. Oddly enough we have 3 of the smaller expansions that we haven't even opened yet...Fisherman of Cataan, The Great River & Oilfields of Cataan...at least I think those are their names. Wow, I didn't even now that those expansions existed! I love this game, and have Settlers of Catan, Cities and Knights expansion. mpoh98 wrote: Wow, I didn't even now that those expansions existed! I think they might be for an earlier print. I've always been interested in trying out Settlers of Catan, from what I hear it's very fun. If only I knew someone who had it before I go out and buy it. Maybe I'll just have to bite the bullet and hope for the best. OverLoad wrote: I've always been interested in trying out Settlers of Catan, from what I hear it's very fun. If only I knew someone who had it before I go out and buy it. Maybe I'll just have to bite the bullet and hope for the best. The game is tons of fun, it might take a while to learn it, but once you get the hang of it, it is amazing! And, there are many extensions! If you have others to play board games with, you NEED this game. It is easily my favorite board game. If you lived in North Texas I'd invite you to a game.